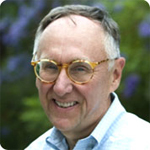 Esri CEO and founder Jack Dangermond spoke on Day Two of the Geodesign Summit 2013 in Redlands, Calif. about geographic information systems (GIS) as a platform on the Cloud that can make the concepts of analytics available to everyone through data sharing. He talked about the Apple model of having multiple devices all sharing the same data, as the model for Esri’s CloudGIS. He described the “Web Map” as almost like a data type, a view, always services based. “This is a more agile architecture that allows us to bring different data sources together, integrate and mash them up,” said Dangermond. “This changes the discussion in organizations.” The discussion has traditionally been focused on normalizing data before adding it to systems. With Web Maps we can interact with data immediately and achieve collaboration much faster. In this way they break down barriers. From these Web Maps organizations are creating a Geospatial Platform that is an open Cloud environment. Many state, city and government organizations are embracing this technology. Eric Wittner of Esri talked about the way CityEngine, Esri’s 3D modeling software for urban environments, can be used. If working with existing buildings or a developer brought buildings for you to add to a model, you can zoom into the courthouse building, for example, then add and replace “block” the courthouse textured and rendered, scaled to the right georeference, and it will be where it should be in the model. You can add façade imagery or roof imagery. This type of imagery can also be added to other building features. You can edit in CityEngine without having to take it out to a CAD program, and you can see texture applied to the building. Making geographically based design decisions about driving policy is a new way of looking at policy. A pre-design policy driven assessment can include the percentage of sky seen from various buildings at specific angles. Esri wants to push these templates out as Geodesign services available to the developer. Several examples were given of the use of CityEngine. An example was given using CityEngine to model the impacts of transit-oriented development in 3D for the City of Honolulu. Planners were able to create an urban expansion model to show stakeholders density and different scenarios to address expansion. CityEngine can also be used to create a 3D urban information model including detailed information of buildings, parking structures and other features of a city. Data can be brought in from digital surface models, elevations, renderings and aerial imagery, shadow, building information models and other types of analysis. Elliot Hartley, director of Garsdale Design Limited, a planning & architectural firm in the UK, is working on massing plans for four new cities in southern Iraq. He spoke about “The Instant City – Geodesign and Urban Planning,” using CityEngine. The teams have to finish one phase so outputs can be used in next phase, and smooth flow of data is critical. Cities don’t stand still, said Hartley, especially in Iraq where infrastructure is desperately needed. They are training Iraqi managers to manage the projects. Some of the issues they face are that the people are educated in hostile environments that means the people are very dynamic and accustomed to dealing with change. They use a lot of 3D imagery as their clients expect them and demand a wide variety toward the end of the projects. Clients want to see walkthroughs, and the master plan. These clients are going to the general public who aren’t used to reading maps. Tools used in the past include scanning and georeferencing, digitizing in AutoCAD and ArcGIS, import into SketchUp, rendering software, including hand drawn sketches. CityEngine is valuable because it works with a variety of formats. “We used real data from a project, but this procedural modeler could save us time and change the way we think about our own workflows,” Hartley said. Hartley said that the sketch is really to key to Geodesign, so a lot of their work has been about the sketch. These sketches are then scanned and georeferenced and placed in models. This has cut the time creating a model in half and allowed the firm to keep their design work in house. The model instantly adapts as each dataset/rule is added, according to Hartley. The Instant City relies on a cloud server to make it work. He can imagine a time when GIS would update in real time in CityEngine. Other future thoughts include the access to OpenData, easier and cheaper software, ideas from the gaming industry (“gamification”), large rollable displays for people to draw on, and fiber optic internet connections on the premises is essential. Garsdale works in areas that are not connected well. The Geodesign Summit is very geo-centric, in that the movers and shakers are primarily GIS and geospatial professionals. GIS makes a huge contribution to 3D cities, infrastructure and the bigger picture of land use and ecology which, coupled with building information models and other specific models, offers powerful datasets for many uses. The opportunity to collaborate and share data between planners, architects, GIS professionals, citizens and other stakeholders is much greater now with supporting technologies such as the Cloud and mobile. Technologies are now easier to use, leveling the playing field so that more people can participate and contribute, bringing with them a whole new level of understanding and interest to the building of the cities of tomorrow. This entry was posted on Wednesday, January 30th, 2013 at 11:35 am. You can follow any responses to this entry through the RSS 2.0 feed. You can leave a response, or trackback from your own site. Thanks for the great write-up! You did misquote me slightly, it wasn’t that “It takes 4 days in SketchUp and another ½ day in CityEngine” I said that we can take 4 days in SketchUp for a neighbourhood centre or 1/2 a day in CityEngine to do a whole city quarter! Obviously the time savings are massive and have given us a real edge against our much larger competitors.